FINCA helps Hondurans living in poverty access financial services to improve the quality of life for themselves and their families. 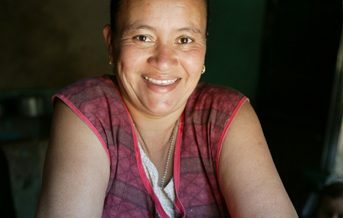 Thanks to FINCA loans, Ana’s family now eats a more balanced diet. Ana’s younger children have all the books and supplies they need and she is helping her older children pay for trade schools. Two daughters help her with the cheese business so they have the freedom of their own spending money. Honduras is one of the poorest countries in Central America. About two-thirds of the population lives below the national poverty line. Poverty rates are especially high among rural and indigenous people and in the south, west and along the eastern border. Poverty in Honduras is compounded by the constant threat of natural disasters – hurricanes and floods – as well as land erosion. Those living in rural areas are the most vulnerable to poverty. Most farming families are subsistence farmers, growing just enough to feed themselves. With restricted access to land, farmers depend on off-farm employment or remittances from family members for support. When poor people have access to financial services, they can earn more, build their assets, create jobs, and cushion themselves against external shocks. Since 1989, FINCA International has been helping thousands of Hondurans improve their lives. FINCA offers financial services, such as loans, savings, money transfers and microinsurance throughout the country.